Situated right in the very heart of the historical centre of Florence, Hotel Roma offers surroundings akin to many of the palatial homes of the Florentine nobles of days gone by. 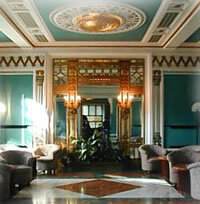 This fabulous four star hotel offers the highest quality of service, stunning interior design and a perfect location. Find out about the Hotel Roma Florence, our rooms, our location - or go directly to our secure reservations page by clicking here. The Hotel Roma has recently undergone massive refurbishment confirming its status as one of the most tranquil and luxurious in the city. Sculpted in classical Florentine style, its pristine marble floors and stained glass windows create an ambiance in grade with the magnificent city itself. Reminiscent of the elegance of vision that defines renaissance Florence, Hotel Roma is perfectly at home alongside the encapsulating architecture and enchanting internal design of its royal surroundings. 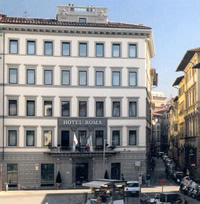 Click here to see the Hotel Roma Florence Interactive 360 Virtual Tour. Yet while inspirational in its grandeur the Hotel Roma is according to many unbiased guide books one of the best Four Star Hotels in Florence, offering guests a haven of relaxation and comfort from the hustle and bustle of the city centre outside. An impeccable commitment to service, courtesy and professionalism the Hotel Roma staff are available 24/7 to take care of the slightest of queries, allowing visitors to bask in a secure and friendly atmosphere free of distractions. A step out of the front door takes us directly into one of Firenze's most beautiful Squares Piazza Santa Maria Novella, and beyond, the winding and cobbled secrets of this charming city. Whatever the reason for visiting, Hotel Roma complements the fascinating experience of the city of Florence in a way that is both memorable and beautiful. Please click here to see Hotel Roma Florence's previous guests’ comments on their stay.